The Net 10 Phone options will be a little different depending on where you live in the United States. All Net10 Phones come with 300 free minutes and two months of service. This is in effect a $30 discount on the price of the phone compared to other prepaid cell phones. No Activation or reactivation fee is a real plus also. Get a Motorola W375 with 300 minutes and free shipping for only $39.99! This is like paying $10 for the phone and $30 for the minutes. You get a good Motorola Camera Phone two months of service and 300 minutes for $39.95. This deal is for a good basic flip phone with a $60 600 minute four month phone card. You will end up with 900 minutes when you activate the phone. Get 900 minutes of airtime and a FREE Net 10 phone for only $60 at Net10.com This is the best value NetTen phone with phone card deal and includes the Motorola V176 With Phone Card. The LG 300 candy bar style phone. A basic phone. The LG 1500 Flip Phone. A good basic flip phone. Motorola V176. A good basic Flip Phone. LG 400. Another good basic flip phone. Samsung T201G. Another good Basic Flip Phone. LG 600G. This is the best NetTen flip phone. Bluetooth Wireless, the only Bluetooth phone. My favorite Net Ten phone is the LG 600g. The Bluetooth works well for using an earpiece. Normally Bluetooth will allow you to send pictures directly to your computer. This has been an issue with this phone. There have been a couple of reports of people being able to transfer pictures with Bluetooth but most people have not been able to. Overall this phone has the best feeling keyboard and is slimmer than most the other phones. 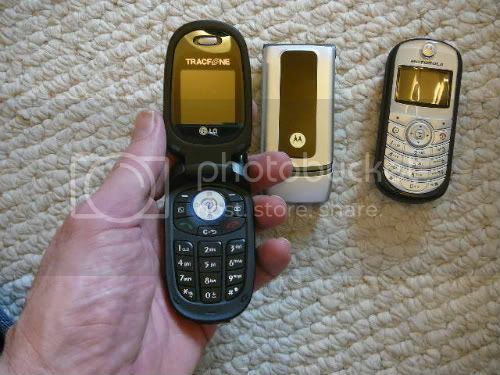 This picture shows the Net 10 LG 600 , Motorola C261 and the Motorola W376 prepaid phones.